This is the view from one of my favorite hangouts, the Ritz penthouse apartment of my brod. I was there last Sunday for a frat party. And again on Wednesday, the night before the Peninsula takeover, for another frat event. The second photo was snatched from Bikoy. Hehe! Indeed it is beautiful sight. In Sydney, Australia, the skyline is well lit at night too but when you pass by them via flyovers and bridget, you see that they are empty. I learned that the buildings are required by government to keep their lights on for tourist purposes, to have a picturesque night skyline. 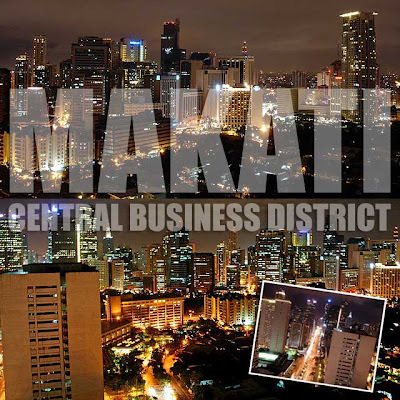 In Makati, the lights are on because there are people working in them-call centers, business processes, etc. Beat that you ozzies! Our night skyline is for real! sorry for the typo. I meant bridges and not bridget. Fantastic Photos! May I grab bro? for the benefit of my foreign friends! SO that they would believe that I don't live in the jungle. And which brods are you talking about? hehe bro naman, of course I know OUR brods I meant which ones... hehehe. saucy! =p maybe next time, dapat may invites na kami, haha. Hi, i would like to ask if i can use this photo for a web page. looks very cool. i like the way it was shot.